In Slovenian Istria during the Christmas holidays, it has long been customary to cook paste from salted cod—bakala in white version with cabbage salad, vrzote (a hearty stew made with shreddedkale, potatoes and beans) and polenta. 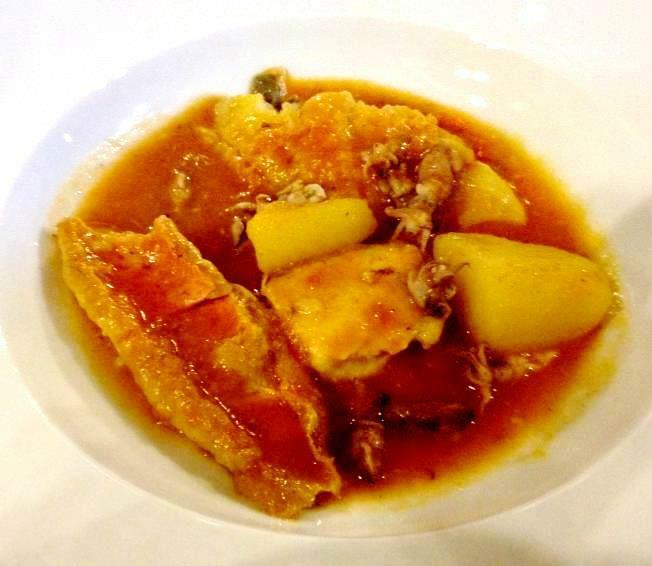 There are several ways of cooking white bakala: stewing, frying, pickling, in tomato sauce with/without potatoes. The latter is called “bakala in red version” (“na rdeče”) in Slovenia and it can be cooked in different ways, but all the recipes are only slightly different from each other. Put the dried and soaked cod into a saucepan, pour with water, salt and cook until it softens. Then take it out of the water, remove bones and cut into pieces. Do not pour out the water, in which the cod was boiled. In a shallow skillet, fry the chopped onion and garlic in olive oil, add the salted cod, pepper a little, and fry until golden brown. Then add the tomato salsa sauce, chopped parsley and a little water, in which the salted cod was cooked (you can also use white wine), mix and cook a little more. Serve with boiled potatoes, polenta or bread.